(Coppell, TX) –As the National Weather Service has placed much of North Texas under a Flash Flood Watch and with rainfall in the forecast today and tomorrow, AAA Texas is reminding drivers about the hazards they may encounter over the next few days, as a precaution. The AAA Foundation for Traffic Safety found that wet weather factors into nearly a million crashes annually across the U.S. Here are some safety tips all drivers should be aware of during periods of heavy rain and possible flooding. Turn Around Don’t Drown. Never attempt to drive on a road that’s covered with water. Turn around and find another route. Personal Safety First. Should you encounter a situation where your vehicle takes on water, always think of personal safety first. Leaving a vehicle to get to safer, higher ground to prevent injury or loss of life should always be the first priority. Never try to start a car that has taken on water. Flood waters are corrosive and contain debris that could enhance any damage the car has already received as a result of taking on water. In some cases vehicles may be salvageable by drying out, but starting a car in flood waters can force water into systems that may not be affected by standing water. Don't use cruise control. Driving on slick roads means your tires will have less traction, and you should be prepared to adjust accordingly. If something goes wrong while you have cruise control on, there may not be enough time to take over the vehicle. Increase your following distance. When facing reduced visibility, you and other drivers will likely need more time to react to surrounding traffic. Leave ample space between you and nearby vehicles to reduce the need for sudden reactions. Drive more slowly. 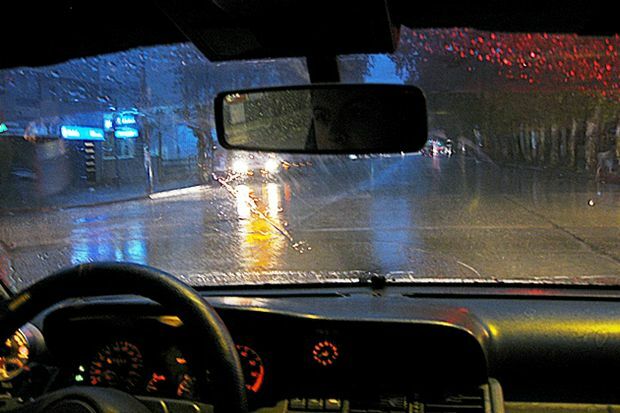 Hydroplaning is an ever-present danger with as little as one-twelfth of an inch of water on the road. Some tires can lose contact with the road even at 35 mph. Reducing your speed will help you remain in control of the vehicle. Know how to respond to a skid. If your vehicle begins to skid, remain calm. Avoid slamming on your brakes; doing so could throw your vehicle off balance and out of your control. Instead, look and steer in the direction you want your vehicle to go. Windshield Wipers: Keep your vision as clear as possible by replacing your wipers every six to 12 months. Streaking or chattering are signs that it’s time to put on a new set. Lights: Ensure your headlights, tail lights, brake lights, and turn signals are functioning properly so other drivers will see you more clearly. Clean haziness from your headlight covers. Tires: Check them at least once a month; maintain your car’s recommended tire pressure. If you see uneven or excess tread wear, consider a suspension repair or wheel alignment. Drive responsibly to help keep yourself, and others, safe.